Adler found out about Own Your Eating after attending one of our seminars at his CrossFit box. He had been tracking macros already but with little success in achieving his goals of improving performance and gaining weight. When Adler changed his numbers in line with the Own Your Eating prescription he finally started to make progress again. 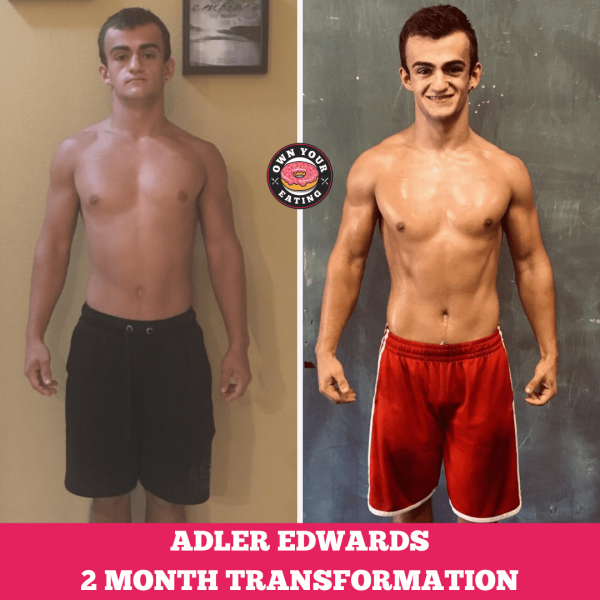 Here’s Adler’s 2 month transformation. I started two months ago after Jason came to my gym and gave a nutrition seminar. I figured out how to start basing my numbers off the Own Your Eating calculation. Multiple people at my gym recommended Own Your Eating and I wanted to improve in my weightlifting and CrossFit and knew that in order to do that I needed to improve my nutrition. Have you lost or gained weight? So far I’ve gained 8 lbs! What other changes have you noticed in your body or in general? I’ve noticed that my body is leaner and that my muscles are getting bigger and more defined. My numbers on my lifts have gone up about 10 lbs. each and I’ve been performing at my best in workouts. What has been your biggest obstacle that you have overcome or are working on? Eating enough food to be able to grow and have sufficient energy to get me through my workouts. What’s the one thing you previously would have deprived yourself of on a diet that you now get to enjoy guilt-free? What’s one piece of advice you would give someone that is just getting started? That you need to trust the process! Track everything that you eat and stick with it every day because the changes in your body will only come if you stick with it.